Sausage Party capitalized on the humor of stereotypes, and some critics hailed the movie for “making fun of everybody.” However, the damages of these supposedly equal actions are definitely not equal. As such, I shall examine the pantomime of the Israeli-Palestinian conflict that was created by the characterization of the Bagel and the Lavash through a transnational feminist lens. Bagel was armored with racial stereotypes of Jews, particularly his nature of always whining or complaining and having a noticeably large nose. Lavash, too, met us with an exaggerated accent, thick, bushy eyebrows, a supposedly iconic beard, an obsession with “extra-virgin” olive oil, and über-conservative, oppressive values about women. The primary source of their mutual hatred stemmed from having to “share the isle” – an obvious allusion to the Israeli-Palestinian conflict. The conflict itself is extremely complex, however, and any attempts to simplify it will render it inaccurate. As Aili Mari Tripp argues in “Challenges in Transnational Feminist Mobilization,” “When outsiders do not take the time to learn about or attend to the particulars of a situation, their efforts can backfire” (107). When Frank the sausage tells Bagel and Lavash that he can’t understand their dispute because the isle seems big enough for the both of them, audiences are intended find humor in such a simple idea not occurring to them earlier, whereas the real humor lies in these audiences often failing to understand how these conflict came about, as well as their crucial involvement in it. When the U.N. (arguably orchestrated by the U.S. and other Western superpowers) decided to intervene and “save” by diving up the land, a majority of the land went to the Jews, despite being the under-represented population. 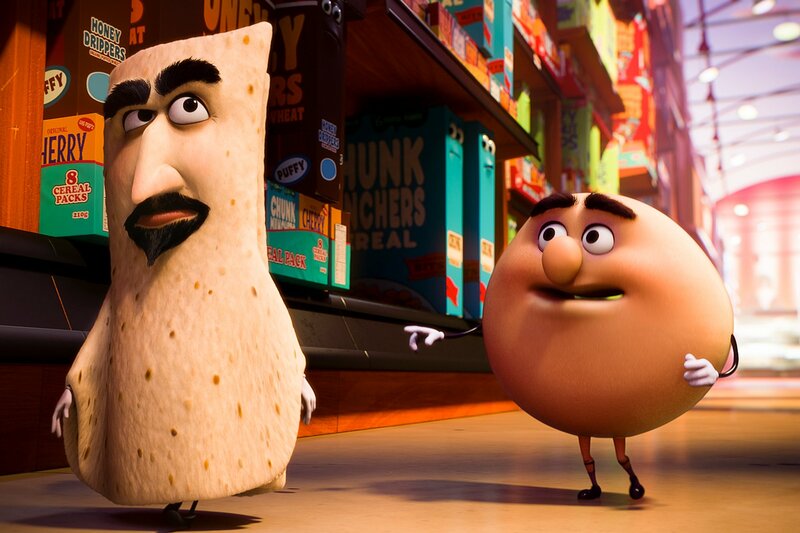 Since Sausage Party caters largely to American and other English-speaking audiences, a space rampant with Islamophobia, it is more damaging to Palestine by offering a space to legitimize their occupation and oppression. The stereotype of the oppressive Muslim Palestinian (Lavash) only re-emphasized existing essentialisms such as oppression of women by Muslim men, which serves to legitimize the detrimental interventions of the US or others. As Lila Abu-Lughod writes in “The Muslim Woman: The Power of Images and the Danger of Pity,” “One of the most dangerous functions of these [stereotypical] images of Middle Eastern or Muslim women is to enable many of us to imagine that these women need rescuing by us or by our governments” (50). Moreover, the U.S. has funded Israel more than any other country in the world, a tool very important in Israel’s violent repression of the Palestinians. As Judith Lorber claims in Gender Inequality: Feminist Theories and Politics, so-called western ideals “are also the source of universal human rights, which can be used to fight subordinating cultural practices” (113). These rights are very often not universal and are also tailored to fit individualistic societies; hence, they too provide a justification for Western powers to intervene to suit their benefit. Hence, the portrayal of an over-simplified fight over the isle fails to take into consideration the involvement of many other factors of the source of conflict and the role other parties (such as the US) had to play in it.